M Srivastava, A Sharma, M Shahid, S Pandey, V Kumar, A Singh. In Silico Primer Designing And Validation For Specific Molecular Identification Of Trichoderma Species. The Internet Journal of Genomics and Proteomics. 2014 Volume 7 Number 1. The study reports the implementation of PCR primers for a quick and accurate molecular identification of Trichoderma species viz. T. viride, T. harzianum, T. asperellum, T. virens, T. atroviride, T. longibrachiatum and T. koningii. The research encompasses an in silico (or bioinformatics) approach to design such specific primers and calculate their properties such as length, melting temperature, GC content (%), PCR product size (in base pair). A complete set of forward and reverse primers for the seven strains of Trichoderma species (isolated from different farm fields of an Indian State) is generated using online tools such as FastPCR and PCR Primer Stats. The designed primers also do not show any relevant cross reactivity with the gene sequences of other database organisms. Thus, they are found to be specific and true to the isolated strains of Trichoderma species. PCR primers are sequenced and then used to amplify the gene sequences of each Trichoderma species in a thermal cycler. 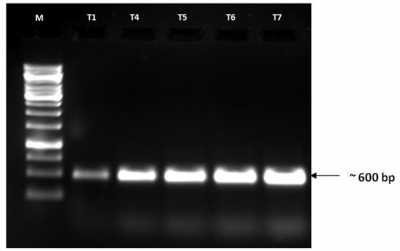 The amplified products are then electrophoresed on agarose gel which indicated that all the selected primers produced PCR products that lie close in approximation to the predicted product size. Trichoderma, a soil borne filamentous fungi, exhibits a wide range of features that have imparted immense popularity to this genus among the fungal genome diversity. It holds a unique place in the fungal kingdom despite being commonly found in soils and grown on barks and other innumerable substrates. Trichoderma species is well known for its “Biological Control Activity” as it can protect the plants and crops from other pathogenic fungi simultaneously providing nutrition that helps in plant growth. Past researches on Trichoderma have subsequently resulted in the generation of large amounts of biological data. Several scientists have successfully identified a number of potential species of the genus Trichoderma from various parts of the world. The mycoparasitic activity exhibited by Trichoderma species has provided a strategy for biological control of pests for plant protection in an environment friendly manner and that is why it is widely accepted worldwide as a “Biocontrol Agent” . Although morphological identification of Trichoderma species is carried out initially soon after isolation but it becomes extremely necessary to identify and disseminate the species at molecular level. Molecular identification and characterization of fungal genomes is most commonly performed with a universal set of ITS markers that amplify the specified 18S rRNA fragment of the fungal DNA. Internal Transcribed Spacer (ITS) regions of nuclear DNA have now been selected as the standard marker for fungal DNA barcoding and in analyzing the fungal diversity [2,3]. Molecular identification through DNA barcoding has gained success to such an extent that the International Union of Microbiological Societies has hosted an official website of International Subcommission on Trichoderma and Hypocrea Taxonomy (http://isth.info/). This website is designed as an open platform to gather the most recent expert knowledge on Hypocrea/Trichoderma taxonomy and evolution. It also aims to present a collection of easy tools for quick molecular identification of Hypocrea/Trichoderma based on DNA BarCode. The TrichOKEY and TrichoBLAST programs available on the website aid in the quick identification of Trichoderma/Hypocrea species by locating the various combinations of ITS anchors in the user-entered nucleotide sequence . Bioinformatics has now stepped into every arena of scientific research speeding it up through the use of computers and information technology providing accuracy at the same time. On the viewpoint of agriculture, bioinformatics has aided in decoding plant genomes and in studying the expression of various genes involved in a particular mechanism. Use of bioinformatics in agriculture has led to the identification of genes and their evolution, diversification, function, mutation, expression in different environmental conditions and how a gene (or genome) codes for a protein (or proteome). Genomics and proteomics analysis can help in accelerating the scientific discoveries in agriculture that can be used to improve crop production, plant protection, disease diagnosis, etc. .
Trichoderma is considered as a boon to Indian agriculture as it incorporates various factors such as being an environment friendly fungi, a biocontrol agent and plant growth promoter. Bioinformatics has been dragged into this pipeline together with biotechnological aspect of fungal dissemination as it is cost-effective, time saving and produces better results to achieve the desired goals. A finite number of ITS and tef sequences are being used till date for the molecular identification of the fungal genus Trichoderma that are limited to the successful and accurate identification of a few species only. So, an attempt has been made, using bioinformatics approach and tools, to generate new combinations of ITS primers that are both species and strain specific. Bioinformatics analyses of the region specific strains of Trichoderma species, right from obtaining the nucleotide sequences from NCBI database and then designing a new set of primers for their identification is the focus of this research. In silico primer designing taking all the required parameters into consideration for the species of interest is done with the help of bioinformatics tools and methods. This is done to obtain strain specific primers (or markers) for all the species under study viz. Trichoderma viride, T. harzianum, T. asperellum, T. virens, T. atroviride, T. longibrachiatum and T. koningii. Java based software FastPCR was used for designing the primers as it has a wide range of parameters that are checked prior the prediction of a specific gene sequence that can be used as a primer . The in silico oligonucleotide search helped in discovering target binding sites, calculating the melting and annealing temperature thereafter testing the primer’s efficiency before it is taken into the lab . 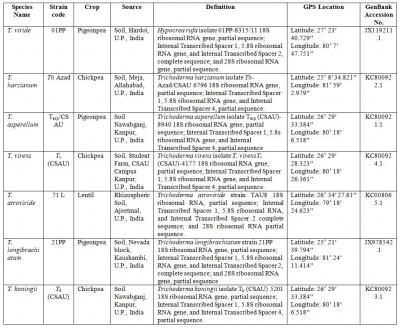 Seven strains of Trichoderma species were isolated from the rhizospheric soils of various wilt infected farm fields of an Indian State (Table 1). These were then isolated, morphologically examined and submitted to the Indian Type Culture Collection (ITCC). Details of Trichoderma species examined. Molecular detection and identification of the isolated strains was carried out with a universal set of ITS markers the gene sequences of which were later sequenced and submitted to NCBI database . Upon successful submission of the nucleotide sequences, these sequences were retrieved with their accession numbers and used for in silico primer designing. FastPCR, a java based tool, was employed for designing the primers for each of the seven Trichoderma species. BLASTn suite is implemented to check for the cross reactivity of primers with other sequences in the database . Primer features calculation and validation of the quality of the same was done with the help of another bioinformatics tool PCR Primer Stats (http://www.cellbiol.com/sequence_manipulation_suite/pcr_primer_stats.php) . This program not only calculates the general properties of the primers such as base count, sequence length, GC content (%), molecular weight, melting temperature (Tm), but also scales the user entered primers on a suitability level determining the self annealing feature and hairpin formation. The designed primers for all the seven Trichoderma species were then sent to the Merck Laboratory (Bangalore, India) for sequencing. The oligonucleotide sequences were obtained with their melting temperatures (˚C). The annealing temperatures were calculated by taking the average of the minimum and maximum temperatures of each of the forward and reverse primers. The PCR-amplification reactions were performed in a 50 ml mixture containing 50 mM KCl, 20 mM Tris HCl (pH 8.4), 2.0 mM MgCl2, 200 mM of each of the four deoxynucleotide triphosphates (dNTPs), 0.2µmM of each primer, 40 ng/ml of template and 2.5 U of Taq polymerase. The cycle parameters included an initial denaturation at 94°C for 5 min, followed by 40 cycles of denaturation at 94°C for 1 min, primer annealing at the above calculated temperatures for 2 min, primer extension at 72°C for 3 min and a final extension at 72°C for 10 min. 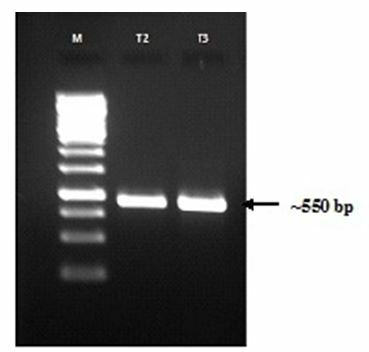 Amplified products were separated on 1.2% agarose gel in TAE buffer, pre-stained with ethidium bromide (1mg/ml) and electrophoresis was carried out at 60 V for 3 hours in TAE buffer. This study attempts to design a new set of ITS primers that are specific for the strains of Trichoderma species identified in different farm fields of an Indian state. The primers are designed using an in silico approach and then tested in vitro to test their efficiency and ability to amplify the desired fragments. Thus, the new set of primers can be used for successful and quick identification of the specific strains of Trichoderma species. FastPCR software was used for designing specific primers as this tool provides many advantages in terms of primer properties such as calculating melting temperature, GC content, hairpin formation, self-annealing, primer quality, base count and PCR fragment size (in bp). The tool generates a list of primers first and then produces a list of primer pairs (forward and reverse) simultaneously giving their melting temperatures and primer quality that eases the selection of primer pairs that can be used for the amplification of the DNA sequences. The nucleotide sequences of the seven strains of Trichoderma species were retrieved from NCBI GenBank database with the accession numbers viz. JX119211, KC800922, KC800921, KC800924, KC008065, JX978542 and KC800923. FastPCR program displayed a list of several oligonucleotide sequences capable of amplifying the gene sequence of interest but only specific pairs were selected consisting of a forward and a reverse primer for each Trichoderma species. Table 2 shows the list of selected primers and their melting temperatures. Primer pairs and their melting temperatures (Tm). 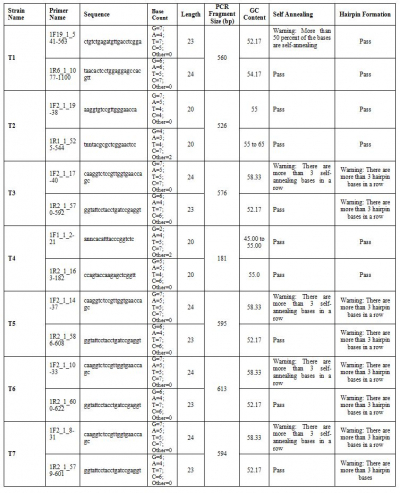 Upon successful in silico designing of PCR primers, these were checked for their efficiency in an online program named as PCR Primer Stats. -The primers do not have a 5'-phosphate group. -Combined concentration of K+ and Na+ in the reaction = 50 millimolar. -Mg+2 concentration in the reaction = 1.5 millimolar. -Primer concentration in the reaction = 200 nanomolar. PCR Primer Stats accepts a list of PCR primer sequences and returns a report describing the properties of each primer, including melting temperature, percent GC content, and PCR suitability. It helps us in evaluating potential PCR primers from the list of primers designed by FastPCR (Table 3). Properties of the selected primer pairs for each strain of the Trichoderma species. The designed pairs of ITS primers were also checked in BLASTn program in order to confirm their specificity for each Trichoderma species. No cross-reactivity of the primers was found with any other organism. This step is a strong validation of the prediction that has been made in the study. The selected primers were validated in wet lab where the purified genomic DNA of a selected strain was amplified by the primer first in a thermal cycler (at the specified melting temperature conditions) and then electrophoresed in agarose gel to check whether the amplification was done determining the location of the amplified bands subsequently. The primers were found to amplify the gene fragments of all the selected strains of Trichoderma species at respective locations when compared to the marker ladder. The PCR fragments for the strains T2 and T3 were located at an approximation of 550 bp which lies close in vicinity to their predicted locations i.e., 526 and 576 bp respectively (Figure 1); whereas, the bands for all the remaining strains were located at an approximation of 600 bp and their actual locations were 560, 181, 595, 613 and 594 bp for T1, T4, T5, T6 and T7 respectively (Figure 2). None of the primers were found to disqualify the parameters of being a specific and accurate one for the identification of a gene of interest. Trichoderma has been widely accepted worldwide as an effective biocontrol agent thus has become a hot topic of research since the beginning of the twentieth century . Monte and Lobell  described well about Trichoderma and its use in the organic agriculture mentioning how it responses against the pathogens stimulating plant growth simultaneously and does not even accumulate in the food chain. Trichoderma has emerged as an environment friendly biocontrol agent. Primer designing is an important step in the molecular diagnosis and detection of a disease, be it in plants or animals. Biotechnological and bioinformatics approach such as cloning and sequencing can only be applied once a specific strain or causing agent is detected . The in silico primer designing approach for the detection of Trichoderma species has opened up the pathway of discovering new insights in exploring the species as an antagonist against soil borne plant pathogens such as Fusarium, Alternaria, Rhizoctonia, Sclerotium, etc. to name a few. These plant pathogens cause harm to the crops and Trichoderma species has profound effects when it interacts with these pathogens thereby protecting the crops against such soil borne pathogens. The new set of primers designed in this study is acceptable as it has a good GC content, no cross-reactivity, no hairpin formation, length, melting temperature and PCR product (in bp). Internal Transcribed Spacer (ITS) regions have been selected as the barcode for the identification of Trichoderma thus an attempt has been made to search for alternative ITS primers that can be used for specific strain identification [2-4]. The study has successfully identified a new set of forward and reverse ITS primers that can amplify the specific 18S rRNA gene fragment of Trichoderma species under consideration. These can be used for gene identification and their expression against the interacting pathogen. The study reports an enhanced and selective list of PCR primers that possess the ability to amplify the 18S rRNA gene present in Trichoderma species. The list of primers have first been designed through an in silico approach using FastPCR tool; checked for cross-reactivity in BLASTn suite; validated in PCR Primer Stats tool; and, finally sequenced and electrophoresed. The set of forward and reverse primers for each of the seven Trichoderma species have been found to amplify and detect the gene fragments of all species at respective loci. Thus, it can be concluded that these primers can now be used for the molecular identification purposes and also to detect genes in the Trichoderma genome. The authors are grateful to the financial support granted by the Indian Council of Agricultural Research under the Niche Area of Excellence programme on “Exploration and Exploitation of Trichoderma as an antagonist against soil borne pathogen” running in Biocontrol Laboratory, Department of Plant Pathology, Chandra Shekhar Azad University of Agriculture and Technology, Kanpur-208002, Uttar Pradesh, India. Kubicek CP, Herrera-Estrella A, Seidl-Seiboth V, et al. Comparative genome sequence analysis underscores mycoparasitism as the ancestral life style of Trichoderma. Genome Biol 2011; 12: R40. Bellemain E, Carlsen T, Brochmann C, et al. ITS as an environmental DNA barcode for fungi: an in silico approach reveals potential PCR biases. BMC Microbiology 2010; 10: 189. Schoch CL, Seifert KA, Huhndorf S, et al. Nuclear ribosomal internal transcribed spacer (ITS) region as a universal DNA barcode marker for Fungi. Proc Natl Acad Sci U S A 2012; 109: 6241-6. Druzhinina I, Kopchinskiy AG, Komon M, et al. An oligonucleotide barcode for species identification in Trichoderma and Hypocrea. Fungal Genetics and Biology 2005; 42: 813–28. Xue J, Zhao S, Liang Y, Hou C, Wang J. Bioinformatics and its Applications in Agriculture. In Computer And Computing Technologies In Agriculture, Volume II; Daoliang Li, Ed. Springer: US 2008; pp 977-982. Kalendar R, Lee D, Schulman AH. FastPCR software for PCR primer and probe design and repeat search. Genes, Genomes and Genomics 2009; 3: 1–14. Shahid M, Srivastava M, Sharma A, et al. Molecular characterization of Trichoderma longibrachiatum 21PP isolated from rhizospheric soil based on universal ITS primers. African Journal of Microbiology Research 2013; 7: 4902-6. Altschul SF, Gish W, Miller W, Myers EW, Lipman DJ. Basic local alignment search tool. J Mol Biol 1990; 215: 403-10. Ha TN. Using Trichoderma Species for Biological Control of Plant Pathogens in Vietnam. J. ISSAAS 2010; 16: 17-21. Monte E and Llobell A. Trichoderma in Organic Agriculture. Proceedings V World Avocado Congress 2003; 725-33. Kalendar R, Lee D, Schulman AH. Java web tools for PCR, in silico PCR, and oligonucleotide assembly and analysis. Genomics 2011; 98: 137-144.